Jonathan Rea is Northern Ireland's first motorcycling world champion since Joey Dunlop and Brian Reid in 1986. 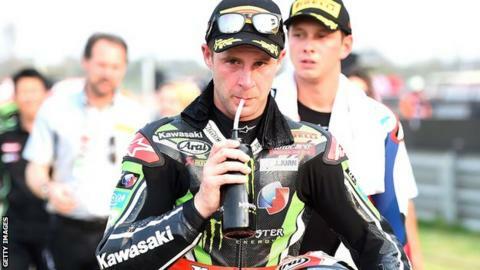 World Superbike champion Jonathan Rea finished second to Kawasaki team-mate Tom Sykes in Saturday's sixth round of the championship in Kuala Lumpur. Sykes started on pole in Sepang and the Yorkshireman set a new lap record on his way to a commanding win over the Northern Ireland rider by 5.6 seconds. Northern Ireland's Rea finished 2.439 seconds ahead of Chaz Davies in third. Rea extended his overall lead over the Welshman to 39 points ahead of Sunday's second race on the Malaysian circuit. Rea has been on the podium of all 11 races this season and heads the WSB standings on 241 points, with Ducati rider Davies second on 202 and Sykes third on 179. On Thursday Rea signed a two-year contract extension with Kawasaki, having dominated last year's championship taking 14 wins in his first season with the racing team.